To start serving the application, double click on “serve”. This should immediately open your default web browser and point it to a localhost address. You should see a stub AngularJS page with Yeoman's logo on it. Next, we need to launch our back-end application server. Less is a CSS pre-processor, meaning that it extends the CSS language, adding features that allow variables, mixins, functions and many other techniques that allow you to make CSS that is more maintainable, themeable and extendable. Less runs inside Node, in the browser and inside Rhino. There are also many 3rd party tools that allow you to compile your files and watch for changes. The quickest place for first experiments with less is our online editor. Less can be used on the command line via npm, downloaded as a script file for the browser or used in a wide variety of third party tools. See the Usage section for more detailed information. To see all the command line options run lessc without parameters or see Usage. See Usage for more information. See the Usage section for details of other tools. Client-side is the easiest way to get started and good for developing with Less, but in production, when performance and reliability is important, we recommend pre-compiling using node.js or one of the many third party tools available. Make sure you include your stylesheets before the script. When you link more than one .less stylesheet each of them is compiled independently. So any variables, mixins or namespaces you define in a stylesheet are not accessible in any other. Or for brevity they can be set as attributes on the script and link tags (requires JSON.parse browser support or polyfill). Get the latest Less.js source code by downloading it directly from GitHub. Fork the project and send us a pull request! Update note: This tutorial has been updated to React Native 0.34 by Tom Elliot. The original tutorial was written by iOS Team member Colin Eberhardt. Additionally (unlike Titanium), React introduces a novel, radical and highly functional approach to constructing user interfaces. In brief, the application UI is simply expressed as a function of the current application state. The key point with React Native is that it aims to primarily bring the power of the React programming model to mobile app development. It is not aiming to be a cross platform, write-once run-anywhere, tool. It is aiming to be learn-once write-anywhere. An important distinction to make. This tutorial only covers iOS, but once you’ve learned the concepts here you could port that knowledge into creating an Android app very quickly. Through Swift, you’ve no doubt been learning new and more functional ways to encode algorithms, and techniques that encourage transformation and immutability. However, the way in which you construct your UI is very much the same as it was when developing with Objective-C: it’s still UIKit-based and imperative. Through intriguing concepts such as a virtual DOM and reconciliation, React brings functional programming directly to the UI layer. This is used by React Native to figure out when your code changes and rebuild accordingly. It’s like having Xcode do a build each time you save your file. This uses the Node Package Manager to fetch the CLI tool and install it globally; npm is similar in function to CocoaPods or Carthage and is packaged with Node.js. The source code of the React Native framework is also available via GitHub if you wish to dig deeper. This creates a starter-project containing everything you need to build and run a React Native application. If you get complaints about the version of node, make sure the one installed by brew is the one in use. Run brew link --overwrite node in the terminal. If you look at the created folders and files you will find a node_modules folder, which contains the React Native framework. 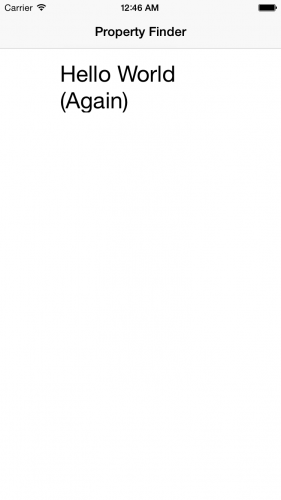 You will also find an index.ios.js file, which is the skeletal app created by the CLI tool. There is also an ios folder, containing an Xcode project and the small amount of code required to ‘bootstrap’ your application. Finally, there are Android counterparts, although we won’t be touching on those in this tutorial. This is the React Native packager, running under node. You’ll find out what it does shortly. Don’t close the Terminal window; just keep it running in the background. If you do close it by mistake, simply stop and re-run the project via Xcode. 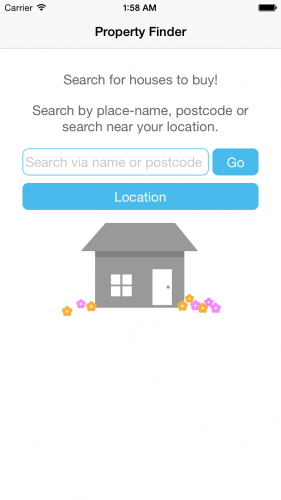 Before getting started on the property search application, you’re going to create a very simple Hello World app. You’ll be introduced to the various components and concepts as you go along. Note: For a more detailed overview of Strict Mode, I’d encourage you to read Jon Resig’s article ECMAScript 5 Strict Mode, JSON, and More. This loads the react & react-native modules and assigns them to variables called React & ReactNative. React Native uses the same module loading technology as Node.js with the require function, which is roughly equivalent to linking and importing libraries in Swift. This defines a single style that you will shortly apply to your “Hello World” text. If you’ve done any web development before, you’ll probably recognize those property names. The React Native StyleSheet class used to style the application UI is similar to the Cascading Style Sheets (CSS) used on the Web. 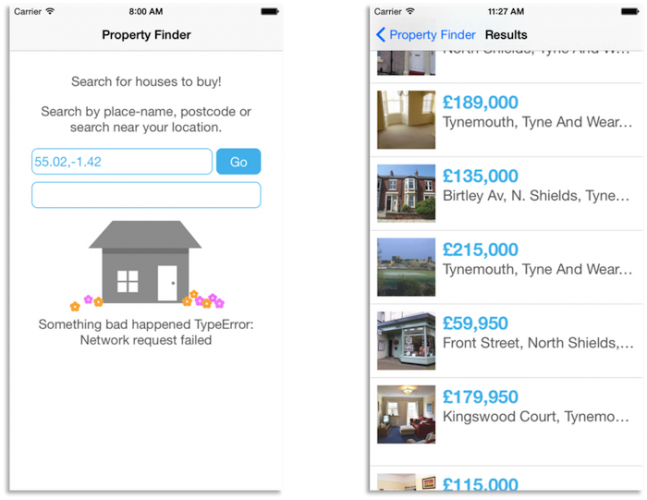 PropertyFinderApp extends React.Component, the basic building block of the React UI. Components contain immutable properties, mutable state variables and expose a method for rendering. Your current application is quite simple and only requires a render method. React Native components are not UIKit classes; instead they are a lightweight equivalent. The framework takes care of transforming the tree of React components into the required native UI. AppRegistry defines the entry point to the application and provides the root component. Still don’t trust me? :] Verify it for yourself: within Xcode, select Debug\View Debugging\Capture View Hierarchy and take a look at the native view hierarchy. You will see no UIWebView instances anywhere! 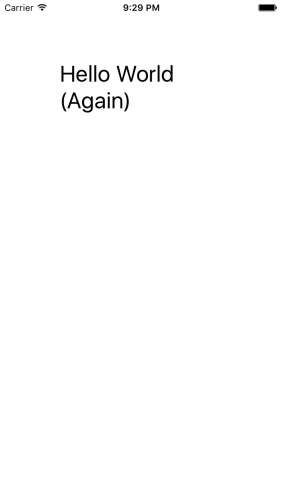 Your text is being displayed in a view called RCTText. But what is that? 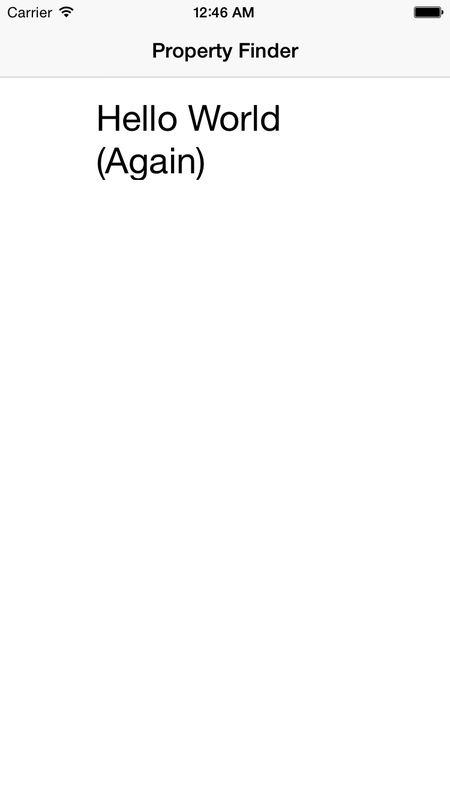 Back in Xcode select File\Open Quickly… and type in RCTView.h. Notice RCTView inherits directly from UIView. Neat! Save your changes to index.ios.js and return to the simulator. Press Cmd+R, and you’ll see your application refresh to display the updated message. Note: If you are feeling inquisitive, take a look at your ‘bundle’ in the browser to see what the JSX is transformed into. Okay, enough of this “Hello World” fun; it’s time to build the real application! 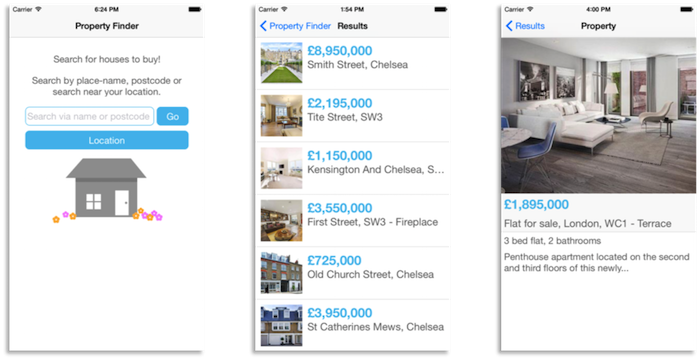 The Property Finder app uses the standard stack-based navigation experience provided by UIKit’s navigation controller. It’s time to add this behavior. You’ll keep the “Hello World” text display around a little longer, but it won’t be the root component of your app anymore. This constructs a navigation controller, applies a style and sets the initial route to the HelloWorld component. In web development, routing is a technique for defining the navigation structure of an application, where pages — or routes — are mapped to URLs. You’ll find out what flex: 1 means a bit later in this tutorial. There’s the navigation controller with its root view, which is currently the “Hello World” text. Excellent — you now have the basic navigation structure for your application in place. It’s time to add the ‘real’ UI! You’ve already seen the strict mode and the react/react-native import before, but the assignment statement that follows it is something new. This is a destructuring assignment, which lets you extract multiple object properties and assign them to variables using a single statement. As a result, the rest of your code can drop the React prefix; for example, you can refer directly to StyleSheet rather than ReactNative.StyleSheet. Destructuring is also useful for manipulating arrays and is well worth learning more about. render is a great demonstration of JSX and the structure it provides. Along with the style, you can very easily visualize the UI constructed by this component: a container with two text labels. This exports the SearchPage class, which permits its use in other files. The next step is to update the application routing in order to make this the initial route. At this point you can remove the HelloWorld class and its associated style, if you like. You won’t be needing that code any longer. This is using the new component, SearchPage, which you added. So far, you’ve seen basic CSS properties that deal with margins, paddings and color. However, you might not be familiar with flexbox, a more recent addition to the CSS specification that is very useful for application UI layout. It’s great that Facebook has created this as a separate project that targets multiple languages, since this allows for novel applications, such as applying flexbox layout to SVG. This is termed the main axis, and can run either vertically or horizontally. The vertical position of each child is determined from a combination of its margin, height and padding. The container also sets the alignItems property to center, which determines the placement of children on the cross axis. In this case, it results in center-aligned text. You’ve added two top-level views here: one to hold a text input and a button, and one with only a button. You’ll read about how these elements are styled in a little bit. Take care with the formatting; each style property should be separated by a comma. That means you’ll need to add a trailing comma after the container selector. These styles are used by the text input and buttons which you just added. The text field and ‘Go’ button are on the same row, so you’ve wrapped them in a container view using the flowRight style which uses flexDirection: 'row' to horizontally place the items in a row. Rather than explicitly specifying the widths of the input field and button, you give each a flex value to define their relative width. The text field uses the searchInput style with flex: 4, while the button uses the button style with flex: 1; this results in their widths having a 4:1 ratio. The final step to complete the search screen of the application is to add the house graphic. The images are available to download as a zip file. Download and unzip the file. Next, create a directory in your root project folder and call it ’Resources’. 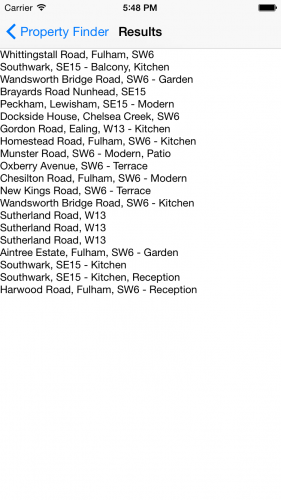 Place the three images of the house in this directory. Asset Catalogs: As you probably know, Apple recommends placing images in Asset Catalogs where possible. In React Native, however, it’s recommended not to. Placing your assets alongside your components helps to keep your components self contained, doesn’t require the App to be relaunched if you add new images and provides a single place for adding images if you are building on both iOS and Android. Note: If you don’t see the house image at this point and see an image that “house” cannot be found instead, try restarting the packager (i.e. the “npm start” command you have in the terminal). Your current app looks good, but it’s somewhat lacking in functionality. Your task now is to add some state to your app and perform some actions. Each React component has its own state object, which is used as a key-value store. Before a component is rendered you must set the initial state. Your component now has a state variable, with searchString set to an initial value of london. This sets the TextInput value property — that is, the text displayed to the user — to the current value of the searchString state variable. This takes care of setting the initial state, but what happens when the user edits this text? This takes the value from the native browser event’s text property and uses it to update the component’s state. It also adds some logging code that will make sense shortly. Whenever the user changes the text, you invoke the function supplied to onChange; in this case, it’s onSearchTextChanged. This is the initial call to render() to set up the view. You invoke onSearchTextChanged() when the text changes. You then update the component state to reflect the new input text, which triggers another render. onSearchTextChanged() then wraps things up by logging the new search string. Whenever the app updates the state of any React component, this triggers an entire UI re-rendering that in turn calls the render of all of your components. This is a great idea, as it entirely de-couples the rendering logic from the state changes that affect the UI. With most other UI frameworks, it is either your responsibility to manually update the UI based on state changes, or it’s done via some type of binding framework which creates an implicit link between the application state and its UI representation. For an example of the later, see this article on implementing the MVVM pattern with ReactiveCocoa. With React, you no longer have to worry about which parts of the UI might be affected by a state change; your entire UI is simply expressed as a function of your application state. At this point you’ve probably spotted a fundamental flaw in this concept. Yes, that’s right — performance! Surely you can’t just throw away your entire UI and re-build it every time something changes? This is where React gets really smart. Each time the UI renders itself, it takes the view tree returned by your render methods, and reconciles — or diffs — it with the current UIKit view. The output of this reconciliation process is a simple list of updates that React needs to apply to the current view. That means only the things that have actually changed will re-render. It’s amazing to see the novel concepts that make ReactJS so unique — the virtual-DOM (Document Object Model, the visual-tree of a web document) and reconciliation — applied to an iOS app. You can wrap your head around all that later; you still have some work to do in the app. First, remove the logging code you just added above, since it’s no longer necessary and just adds cruft to the code. In order to implement the search functionality you need handle the ‘Go’ button press, create a suitable API request, and provide a visual indication to the user that a query is in progress. The new isLoading property will keep track of whether a query is in progress. _executeQuery() will eventually run the query, but for now it simply logs a message to the console and sets isLoading appropriately so the UI can show the new state. The activity indicator renders and the URL for the required query appears in the log. Copy and paste that URL into your browser to see the result. You’ll see a massive JSON object. Don’t worry — you don’t need to understand that! You’ll add code to parse that now. Note: This app makes use of the Nestoria API for searching property listings. The JSON response coming back from the API is pretty straightforward, but you can have a look at the documentation for all the details on the expected request URL and response formats. The next step is to make the request from within your application. You’ll use this to display a range of messages to the user. This makes use of the fetch function, which is part of the Web API, and provides a vastly improved API versus XMLHttpRequest. The asynchronous response is returned as a promise, with the success path parsing the JSON and supplying it to _handleResponse which you are going to add next. This clears isLoading and logs the number of properties found if the query was successful. Note: Nestoria has a number of non-1** response codes that are potentially useful. 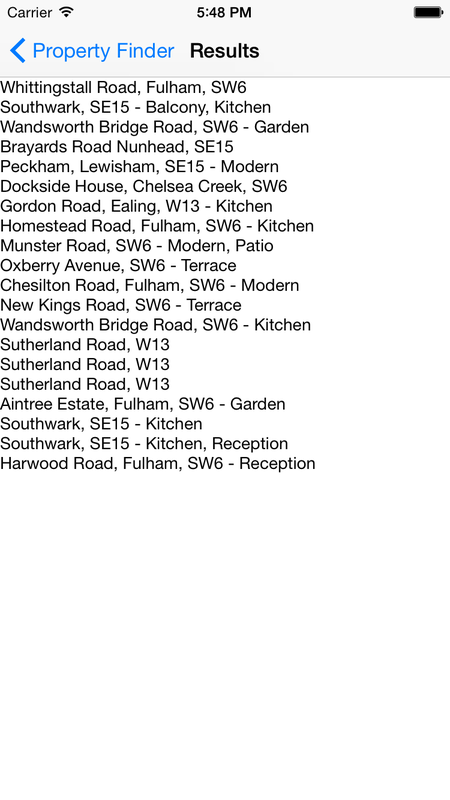 For example, 202 and 200 return a list of best-guess locations. When you’ve finished building your app, why not try handling these and present a list of options to the user? Save your work, rebuild your Xcode project (to make sure your Plist changes are used) and try searching for ‘london’; you should see a log message saying that 20 properties (the default result size) were found. It’s time to see what those 20 properties in real places such as London look like! The above code makes use of a more specialized component — ListView — which displays rows of data within a scrolling container, similar to UITableView. You supply data to the ListView via a ListView.DataSource, and a function that supplies the UI for each row. When constructing the data source, you provide a function that compares the identity of a pair of rows. The ListView uses this during the reconciliation process, in order to determine the changes in the list data. In this instance, the properties returned by the Nestoria API have a lister_url property, which is a suitable check for this purpose. This allows us to use the newly added SearchResults class from within the SearchPage class. The above code navigates to your newly added SearchResults component and passes in the listings from the API request. Using the push method ensures the search results are pushed onto the navigation stack, which means you’ll get a ‘Back’ button to return to the root. 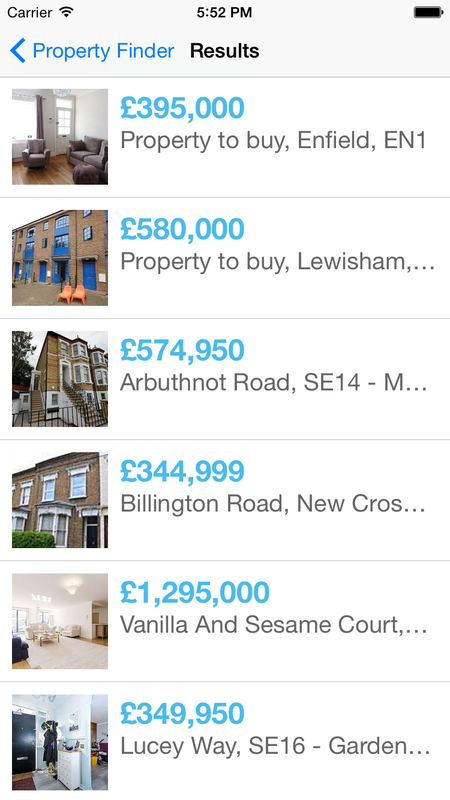 It’s great to see the property listings, but that list is a little drab. Time to liven things up a bit. This React Native code should be starting to look familiar by now, so this tutorial is going to pick up the pace. This defines all the styles that you are going to use to render each row. This manipulates the returned price, which is in the format ‘300,000 GBP’, to remove the GBP suffix. Then it renders the row UI using techniques that you are by now quite familiar with. Of note, an Image is added to the row and is loaded from a returned URL (rowData.img_url) which React Native decodes off the main thread. Also, note the use of an arrow function in the onPress property of the TouchableHighlight component; this is used to capture the lister_url for the row. This method locates the property that was tapped by the user. It doesn’t do anything with it yet, but you’ll fix that shortly. But right now, it’s time to admire your handiwork. 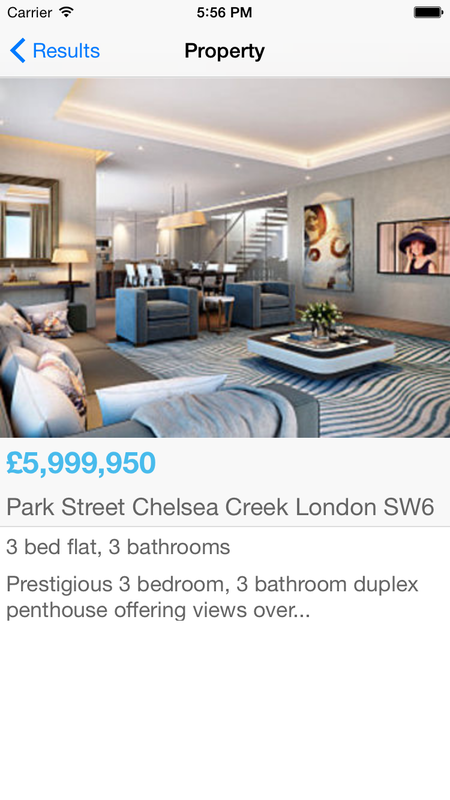 That looks a lot better — although it’s a wonder anyone can afford to live in London! Time to add the final view to the application. The first part of render() performs some manipulation on the data. As is often the case, the data returned by the API is of mixed quality and often has missing fields. This code applies some simple logic to make the data a bit more presentable. The rest of render is quite straightforward; it’s simply a function of the immutable state of this component. Affordable living at it’s finest — that’s a fancy looking pad! 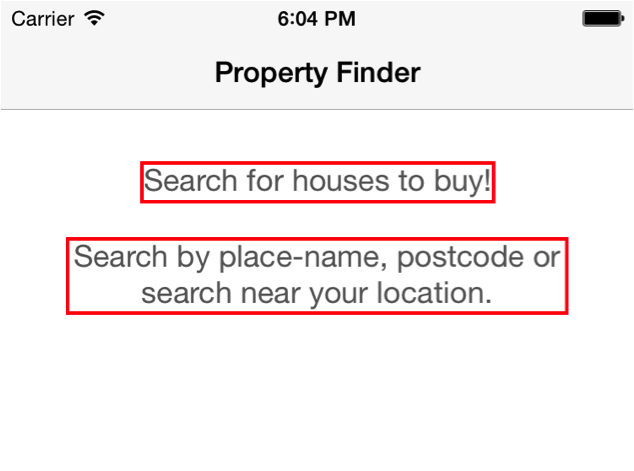 Your app is almost complete; the final step is to allow users to search for nearby properties. 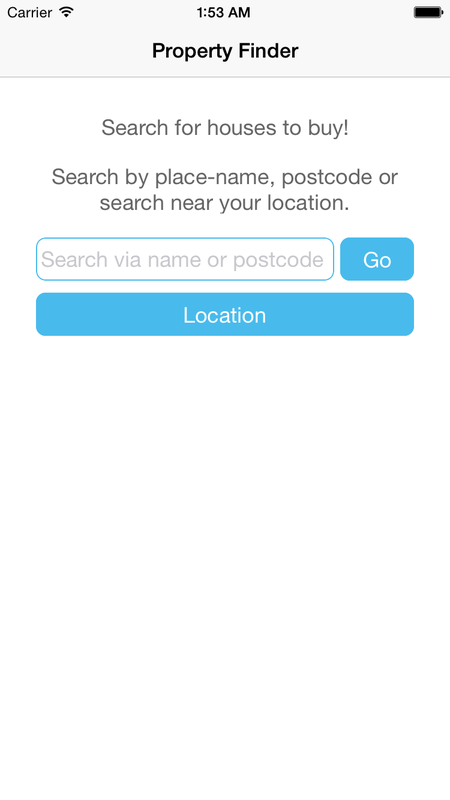 This key details the prompt that you’ll present to the to the user to request access to their current location. When you tap the button, you ‘ll invoke onLocationPressed — you’re going to add that next. The current position is retrieved via navigator.geolocation; this is an interface defined by the Web API, so it should be familiar to anyone who has used location services within the browser. The React Native framework provides its own implementation of this API using the native iOS location services. If the current position is successfully obtained, you invoke the first arrow function; this sends a query to Nestoria. If something goes wrong, you’ll display a basic error message instead. Since you’ve made a change to the plist, you’ll need to relaunch the app to see your changes. No Cmd+R this time — sorry. Stop the app in Xcode, and build and run your project. 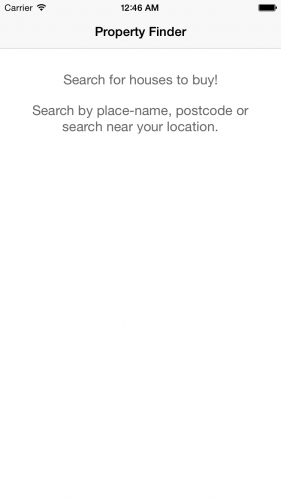 Before you use the location-based search, you need to specify a location that is covered by the Nestoria database. From the simulator menu, select Debug\Location\Custom Location … and enter a latitude of 55.02 and a longitude of -1.42, the coordinates of a rather nice seaside town in the North of England that I like to call home! 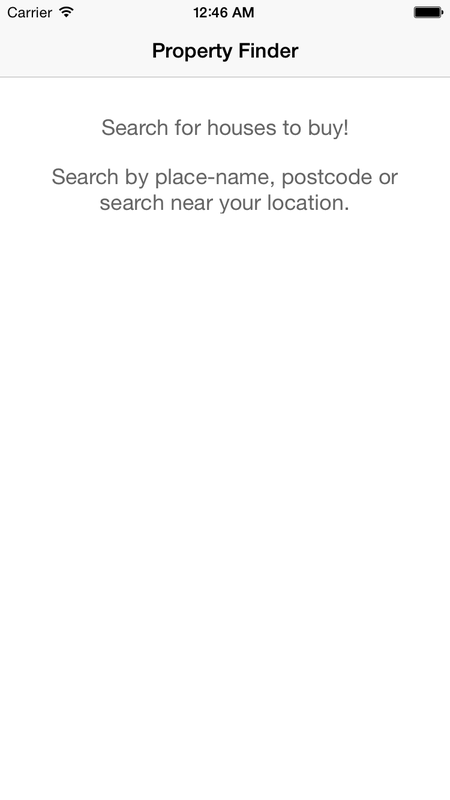 Now hit the Location button, allow location services, and check your results! Note from Ray: Location searching worked for some of us, but not for others (reporting an access denied error even though we gave access) – we’re not sure why at the moment, perhaps an issue with React Native? If anyone has the same issue and figures it out, please let us know. Perhaps you might write your next app using this framework? Or then again, perhaps you will stick with Swift or Objective-C? Whichever path you take, I hope you have learned something new and interesting in this article, and can carry some of the principles forward into your next project. 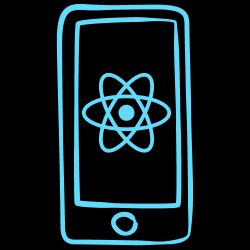 If you have any questions or comments on this React Native tutorial, feel free to join the discussion in the forums below!